It’s important to choose a site that gets enough sunlight for blooms and fruit to develop. Most fruit need 6-8 hours of sunlight for proper fruit development. Choosing a location that is not too sloped is important, you don’t want a wet ditch or a dry hilltop either. You should do a soil test to make sure your nutrients and pH are correct. It’s also a good idea to make sure you have easy access to the trees for watering, pruning, and harvesting. Every tree has different spacing requirements so read about your variety and space accordingly. Also, keep in mind the size of the trees, shrubs and vines at maturity. Many smaller shrubs can grow as under-story to the trees. After choosing the best location for your orchard trees and bushes you must plant them correctly to ensure they grow well. Dig your hole as deep as your pot or root ball and twice as wide. Gently loosen any tight roots and spread out in hole. If your plant is root bound and a tight tangle of excess roots from being in a pot too long then you will want to cut an X on the bottom and up the sides from the X. Place in hole so that top of root ball or pot soil is right at the top of existing area. Too deep and it will rot and too high and it will dry out. Fill in around roots with soil from hole, breaking up any clods and removing any big rocks as you go. Form a soil ring around the drip line of existing canopy so when it rains or is watered the roots will receive the water more efficiently. Water in very well! This first watering not only goes to the tree but it also helps to fill in any air spaces in planting hole. We used a five gallon bucket and poured half in each, allowed to seep down and did it again. You will want to add at least 3 inches of mulch in a wide circle around the tree. Be careful not to have mulch against the trunk or it could rot. This will help hold in moisture during dry times, block out weeds, and protect the roots from extreme cold or hot. Make sure you water it frequently the first two weeks and then gradually cut back after that, but still supplement water in dry spells for at least the first year or two. You don’t want it to be muddy but if the surface dries out in those first two weeks, water again. Once the tree is established well after those first two years you wont really have to water unless the conditions are drought like! Keep in mind when you water to apply a high volume of water all at once so that the moisture level will go deep encouraging roots to go deeper. The deeper your roots, the stronger the plant, and it becomes less susceptible to drought or cold damage. If you only water a little bit every day the roots will grow on the surface and as soon as you miss a day or get a cold snap those surface roots will be damaged and could kill your tree. 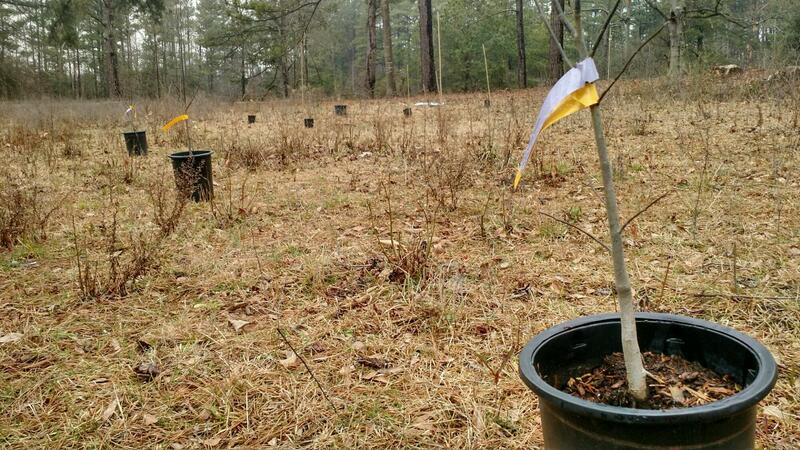 The first winter is when you need to really be careful to watch your forecast, a newly planted tree should be covered if temperatures are very low! Once early spring temps cause your plants to swell up in buds, flowers, or leaves watch for anything below freezing and cover. 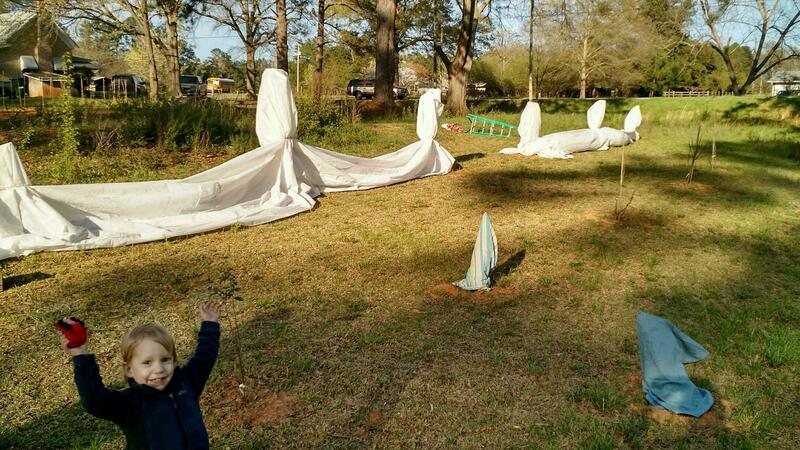 We had a late frost after they were blooming and covered it all with frost fabric, sheets, and pillowcases. This is really important in the first few years but particularly once blooms are set. If your flowers freeze you wont have any fruit… how can you have any fruit if you don’t cover your flowers? If you have deer, watch out! Fence those fruit trees or they will eat every leaf! When fruit comes you will be fighting off birds, squirrels, raccoon, deer… you name it. Other pests you may have and will need to defend against using organic methods will be fungus, bacteria, and insects. Make sure you follow proper IPM strategies for these problems should they occur. Fertilizing is not recommended in the first year. After that, using an all-purpose organic fertilizer should be enough. Always look for signs of deficiencies and do a soil test if there is a problem. 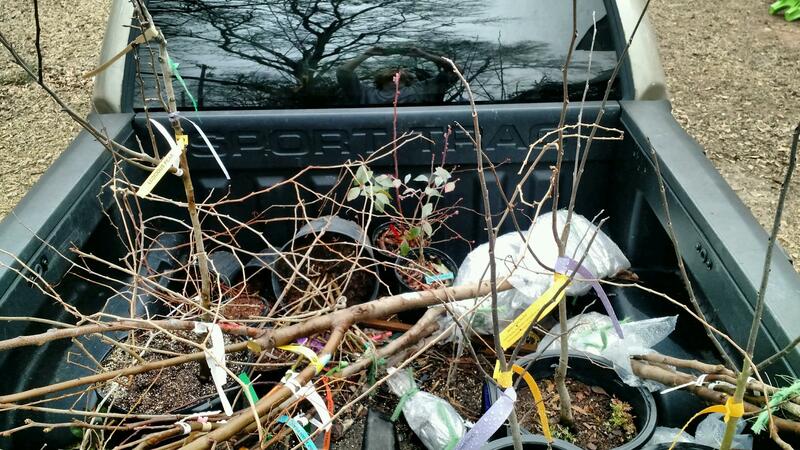 Pruning… This will be more and more important as they grow. First year you don’t do much but as you go you will need to learn each species needs! 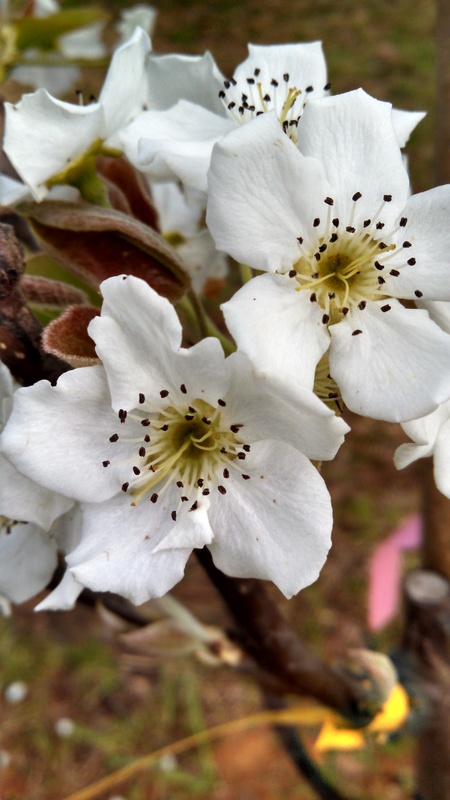 Typically fruit trees will not begin producing any fruit for 2-5 years depending on variety and age. Usually smaller varieties are going to start setting some fruit on the second year. It’s recommended that the first year you pinch off blooms so the plant will focus its energy into developing roots instead of fruit. So take good care of your fruit trees, shrubs, and vines that first year or two and you will eventually be rewarded! 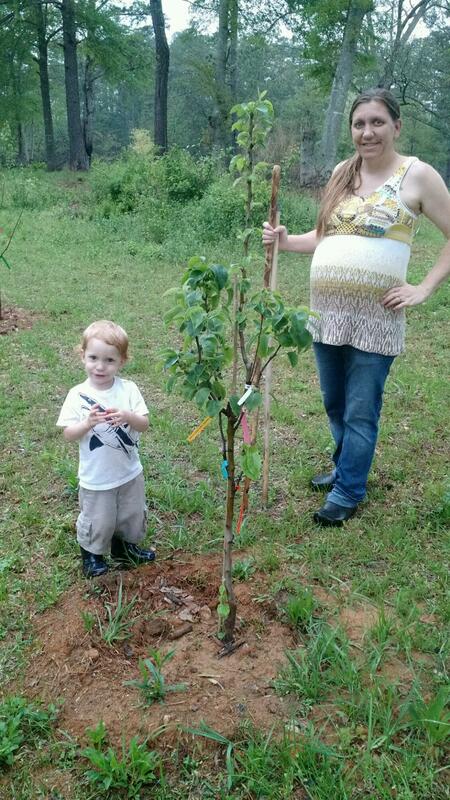 We are really looking forward to picking fruit in a year or two! Have you been dreaming of an Orchard out back? Whats stopping you! Do it and tell us all about it!